Mariners' pitcher Julio Mateo has been in the headlines for all the wrong reasons this year -- blowing games and allegedly assaulting his wife -- so more than a few eyebrows raised when the M's decided on Wednesday to activate Mateo from the AAA inactive list and allow him to join the Rainiers. I'll admit: My first reaction when the news of the alleged assault came out was to dump him -- and while we're being honest, it probably had something to do with the fact that he had been a terrible pitcher this year. My second reaction was similar when I found out the Seattle Police Department had been called to his house one week earlier, and that had nothing to do with his ineffectiveness on the mound. And it was my third reaction when I heard he was activated only after his domestic violence counselor suggested that a return to the workplace might be "beneficial" for Mateo. 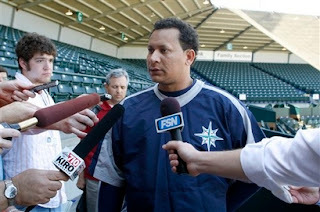 As if playing baseball were somehow good for him, leading to my next thought: "I wonder what kind of 'beneficial' treatment Mateo's wife has gotten lately ..."
But John McGrath wrote a column in The (Tacoma) News Tribune this morning that got me thinking. His piece doesn't necessarily laud the decision, but it certainly doesn't criticize it, either. Once I got past my initial righteous indignation -- after all, we always want a head to roll, especially when it's a guy who makes a million bucks to throw a ball while the rest of us slog through our $40,000 a year jobs -- I really started to try and think of Mateo as a person. No, he doesn't have a constiutional right to play professional sports, but the ultimate goal should not be to punish him -- it should be to help him not continue to be a wife beater. Does it not make sense, then, that the organization that knows him best and can care for him and help him rehabilitate best should try to do that? It's not like this guy is getting a free pass. Anyone who's spent any amount of time around minor league baseball knows that even AAA is a far cry from the majors. And it's not like there's anything really in this for the organization; there are a dozen guys just like Mateo out there to be had for a minimal price. No, the benefit here is the opportunity to forgive -- and potentially change the course of a family. Mateo's got two kids with his wife, and also cares for the five children of his brother, who died in a car accident last year. The impact stretches beyond Mateo. Ultimately, this might not change anything. Mateo, who promises to make the most of his second chance, might end up right back where he was three weeks ago. If this doesn't work, and he ends up back in a police booking room, they can always cut him then. But doesn't it make sense to at least try?